This week we received data out of Europe and the picture is not pretty. The Euro area, now including Germany, saw its economy contract in the fourth quarter. The following chart shows the Euro area as a whole -.6% (black line), Germany (after three quarters of positive growth) printing at -.6%, plus Spain and Italy's accelerated decline. 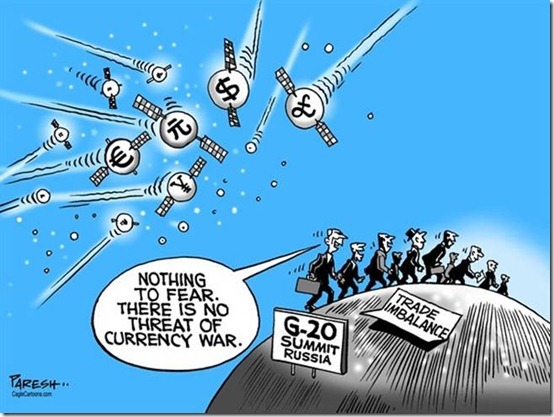 The recent rise in the Euro currency has only provided pressure on the wound as the rest of the world, specifically the U.S. and Japan, continue to up the stakes in the global currency war and the race to debase. A stronger Euro hurts exports (exports add to GDP). Certain economists have told us that the main reason for this economic malaise is the intense austerity (spending cuts) that have been put into place around Europe. Let's take a brief moment to review just how much spending was cut in 2012 in Spain. Government debt grew by 146 billion euros in 2012, rising to 882 billion in total. Debt has risen by 500 billion euros over the last 5 years. I'm not a math professor but those numbers do not appear very "austere" to me. Imagine if real, market driven, spending cuts were implemented in Spain. The following chart shows their surging debt growth as part of their "austerity program." Germany is feeling double the pain as their trading partners within the Eurozone, the area that is not impacted by trade due to currency fluctuations, are seeing their economies and subsequent demand collapse. Look for Germany to continue to "ease" the pressure they bring to the European Central Bank to hold back with full throttle QE programs. The process is fascinating to watch as all the leaders of every developed economy (U.S., Europe, UK, Japan) do everything in their power to self mutilate their own currency in the attempt to sell goods to each other. They must tell the markets they want to destroy their currencies while at the same time promising "safe returns" to all those who invest in the bond markets within their shores. At some point the bonds markets will say enough, but when will that be? 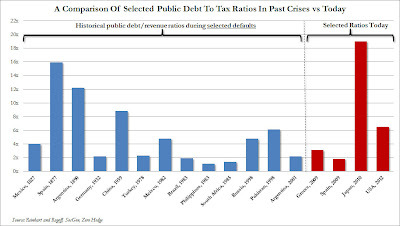 The following excellent chart shows a history of sovereign defaults for specific countries going back to 1827 (blue lines). It shows the total amount of debt the country took on in comparison to their revenue before the bond market said "enough" and forced them into default. The definitive work on the historical study of sovereign debt defaults is This Time Is Different, a book I always recommend for those that believe studying the past is the best way to determine the future. Will this time be different? Do the laws of gravity no longer apply to the government bond markets of the modern world. I think we will soon know the answer to this very important question.